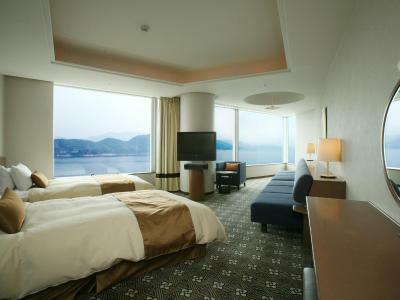 Lock in a great price for Grand Prince Hotel Hiroshima – rated 8.5 by recent guests! It was beautiful property with many amenities. Staff was very friendly and property was clean. Amazing Staff... I was surprised but the service and the availability. 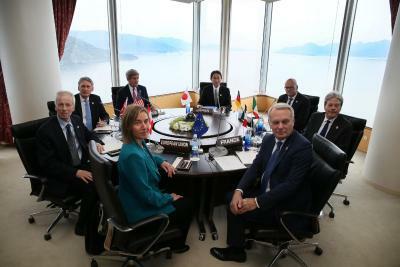 We had a great view of the Hiroshima Bay. 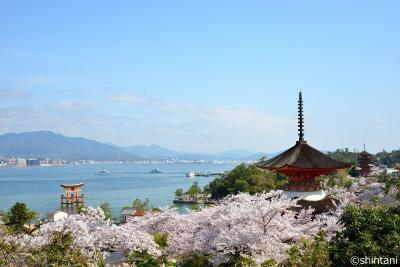 It was also very convenient that there was a boat that took us directly to Miyajima. We really appreciated the great customer service. Beautiful hotel. Parking was reasonably priced and very conveniently located. Overall very good facilities. The bar on floor 23 was a wonderful way of seeing the harbour views and the city at night views. Obviously a hotel which prides itself on its quality facilities and the professionalism of its staff. Access to rooms by a number of lifts was appreciated as was the complementary bus shuttle to the train station. Loved the shuttle bus, breakfast buffet and convenient store. The free shuttle from train station and bus stop at the hotel made traveling easy. 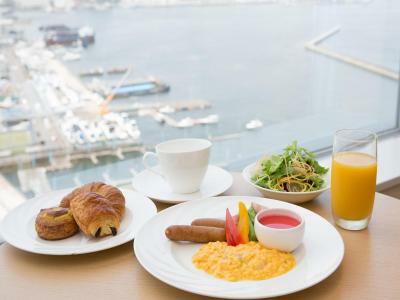 Breakfast buffet was wonderful with an awesome view from 23rd floor. The food quality is very nice. Also, the level of service is excellent. Lost/left my phone on breakfast table, they found and returned it within minutes. Kudos to the staff. Thank you. 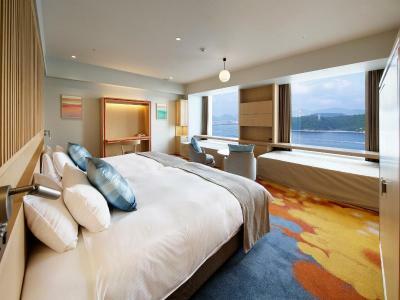 Grand Prince Hotel Hiroshima This rating is a reflection of how the property compares to the industry standard when it comes to price, facilities and services available. It's based on a self-evaluation by the property. Use this rating to help choose your stay! 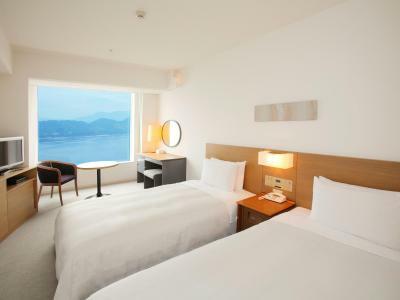 One of our top picks in Hiroshima.Overlooking the Seto Inland Sea, Grand Prince Hotel is located a 15-minute drive from central Hiroshima. The hotel offers 5 dining options, a seasonal outdoor pool and hot spring baths. 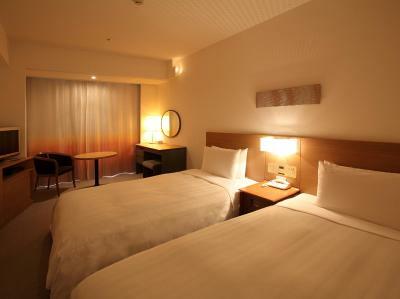 The hotel is featured in Michelin Green Guide Japan 2013. 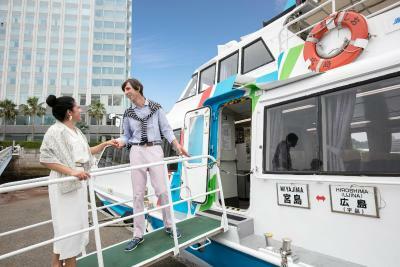 A free shuttle is available from Hiroshima Station, a 30-minute ride away. Luggage storage is available at its Welcome Counter at the station. 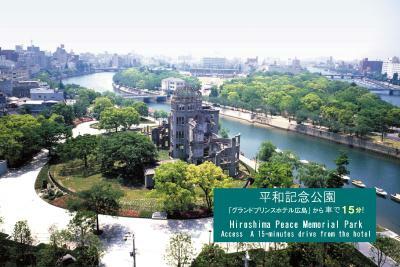 Hiroshima Peace Memorial Park and the Atomic Bomb Dome are a 15-minute drive. 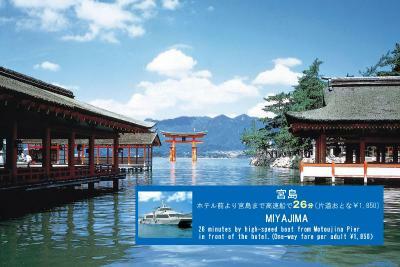 Miyajima Island is 25 minutes away by high-speed boat from Motoujina Pier, located in front of the hotel. 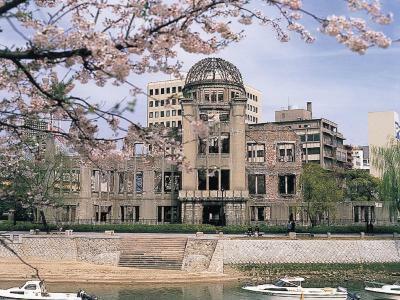 Air-conditioned rooms with a large picture window and a flat-screen TV await guests of the Grand Prince Hotel Hiroshima. Guests can unwind with a bath or watch satellite TV channels. Guests can use the on-site fitness and relaxation facilities such as the spa, sauna, jet bath, fitness center or massage salon, all at an additional charge. 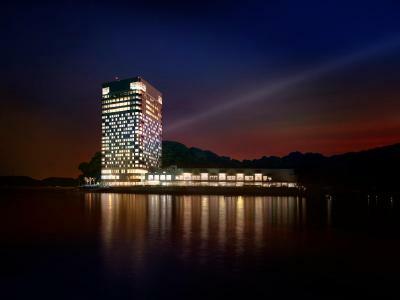 The hotel also provides a business center, travel desk and concierge services. 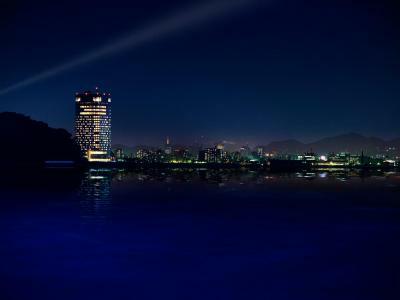 Nadaman Restaurant offers Japanese dishes and 20th-floor views. 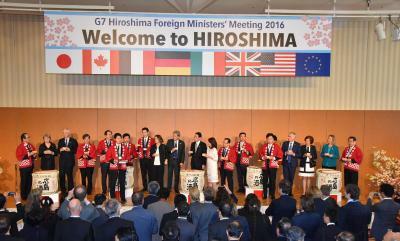 Riho serves a Chinese menu, and guests can enjoy Hiroshima specialty Okonomi-yaki at Kakkun. 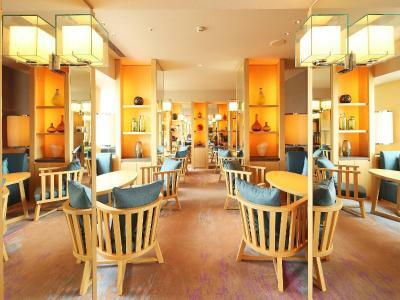 A cafe, bar, buffet restaurant and steak & seafood restaurant are also on site. Guests with a dinner-included plan can enjoy buffet-style dinner at the on-site restaurant. 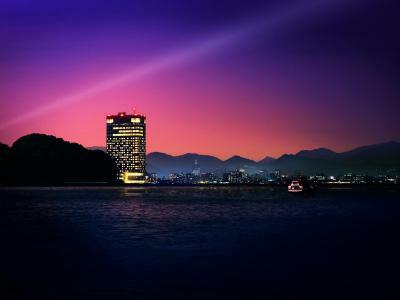 When would you like to stay at Grand Prince Hotel Hiroshima? Located on the Superior Floors (4-12th floors), this air-conditioned room comes with a large picture window and a flat-screen TV. Guests can unwind with a bath or watch satellite TV channels. 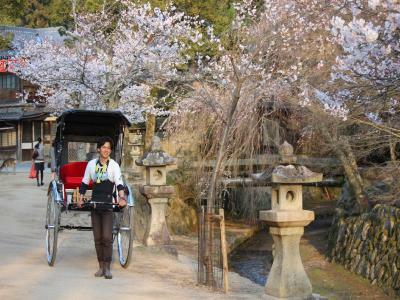 Private parking is available on site (reservation is not needed) and costs JPY 500 per day. 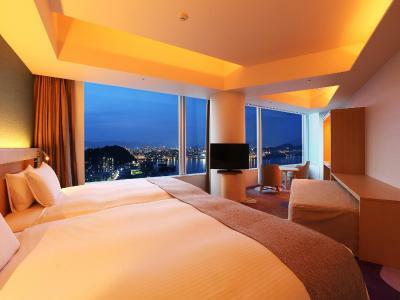 On the Superior Floor (4 – 12th floors), this air-conditioned room comes with a large picture window and a flat-screen TV. 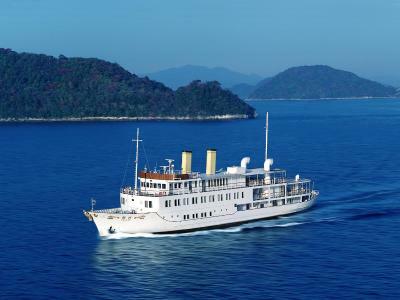 Guests can unwind in the bathtub or watch satellite TV channels. Located on the Superior Floor (4-12th floors), this air-conditioned room comes with a large picture window and a flat-screen TV. Guests can unwind with a bath or watch satellite TV channels. 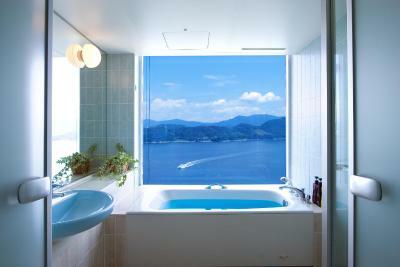 Views of the ocean, mountains and the city can be enjoyed from the bathroom. 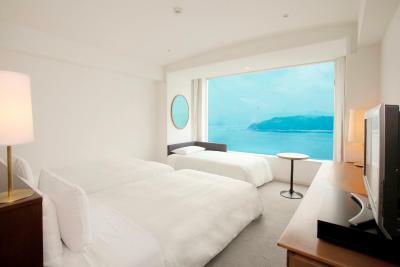 Suite room with beautiful ocean views. You can enjoy the outside view from a bathtub. 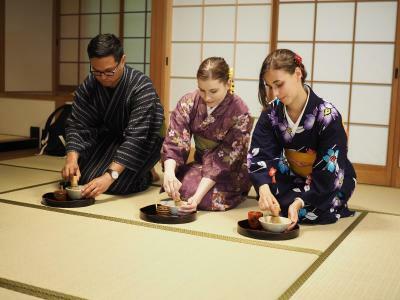 Guests may be allocated a Japanese-style suite depending on availability. Please contact the property directly for more details. This triple room features a satellite TV, seating area and air conditioning. This quadruple room features a electric kettle, satellite TV and seating area. Located on the Club Floor (18-19th floors), this air-conditioned room comes with a large picture window and a flat-screen TV. Guests can unwind with a bath or watch satellite TV channels. Rate includes a complimentary breakfast, snacks and drinks at the club lounge, free access to the hot spring bath, fitness center and seasonal outdoor swimming pool, which is open during summer. Rate includes a complimentary breakfast, snacks and drinks at the club lounge, free access to the hot spring bath, fitness center and seasonal outdoor swimming pool, which is open during summer. Views of the ocean, mountains and the city can be enjoyed from the bathroom. Located on the Club Floor (18-19th floors), this air-conditioned room comes with a large picture window and a flat-screen TV. 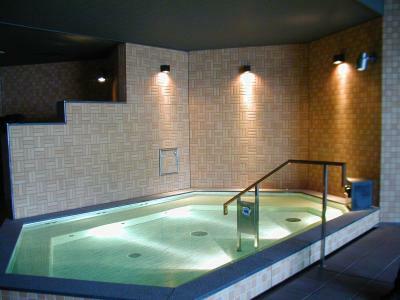 Guests can unwind with a bath or watch satellite TV channels. Rate includes a complimentary breakfast, snacks and drinks at the club lounge, free access to the hot spring bath, fitness center and seasonal outdoor swimming pool, which is open during summer. This triple room features a electric kettle, air conditioning and seating area. This twin room has a satellite TV, seating area and air conditioning. This triple room features air conditioning, electric kettle and seating area. This quadruple room has a electric kettle, flat-screen TV and seating area. This twin room features a seating area, electric kettle and air conditioning. This double room has air conditioning, electric kettle and satellite TV. This suite has a electric kettle, flat-screen TV and sofa. 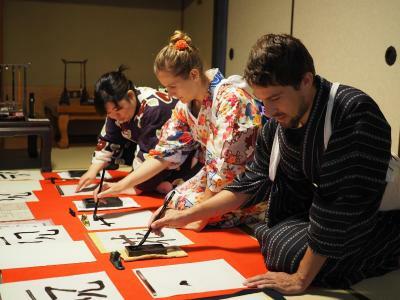 House Rules Grand Prince Hotel Hiroshima takes special requests – add in the next step! 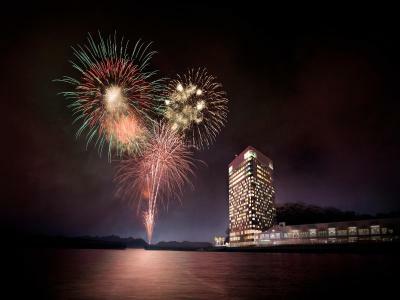 Grand Prince Hotel Hiroshima accepts these cards and reserves the right to temporarily hold an amount prior to arrival. Please note the property will take a photocopy of your credit card at time of check-in for guarantee purposes. If guests are checking in without a credit card to present, the property will require a cash deposit, which is slightly higher than the total amount of the reservation. 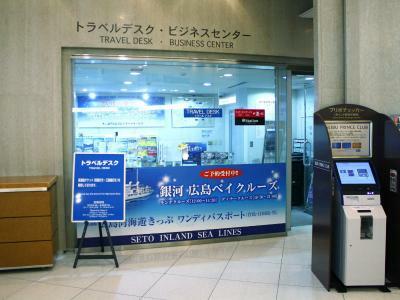 Luggage delivery service between the hotel and the JR Hiroshima Station's Welcome Counter located at the North Exit is available until 14:00, at a surcharge. To use a baby cot, please make a reservation in advance as there are a limited number of baby cots available. Please also note that only some rooms can accommodate baby cots. Guests must check in by 8:00 PM to eat dinner at this property. Guests who check in after this time may not be served dinner, and no refund will be given. Pillows were rock hard and couldn’t sleep well. A kettle, cups and more were provided but there was no coffee, milk or even black tea. It was just green tea and it tasted awful. The meal options are too expensive compared to the value of staying in the hotel. They charge extra for the onsen, too. The bedroom window was wide with a fantastic view. Room temperature was good. 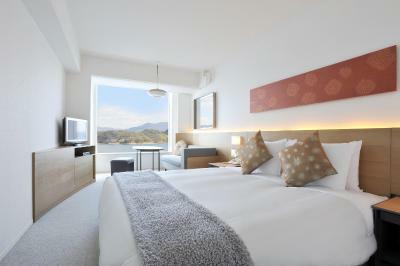 Fabulous views and very comfortable rooms. Everything! Specially the staff, they are great!! Rooms are very small. Was informed at the front desk that no reservations are needed for the restaurants, but when I went to the restaurants they were fully booked! Now how is that possible when you can’t make a reservation? Then went to the Okonomiyaki cafe and wanted 1.5 hours. Locals were standing in line. 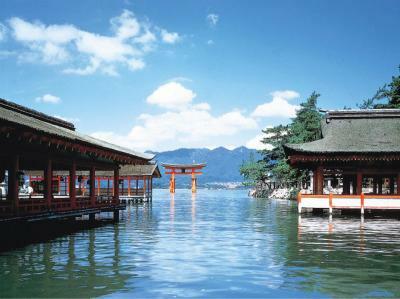 Great staff and awesome point if you are going to visit Miyajima. Recommend. The room was very comfortable and had an amazing view of the sea and small islands. There was a very wide selection of products that you could use for pampering yourself in your room. The hotel may be away from the main attractions but there was a bus just outside the hotel that ran on a regular basis. The hotel also provided free transport to the train station which was great. They provided a wide range of choices for breakfast and all of excellent quality. The staff were always friendly and helpful. It was a little too far from the city and it wasn't quite as clean as I was expecting. That being said, I had no trouble sleeping at night as the bed was comfortable and it was nice to wake up to that view in the morning. 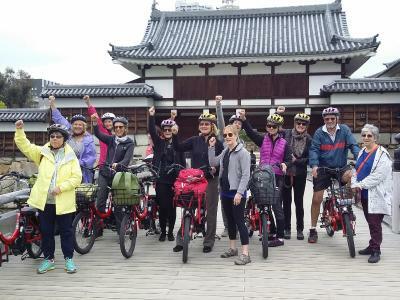 Amazing stay & free jr station shuttle made it comfortable to visit the city - 100% coming back ! 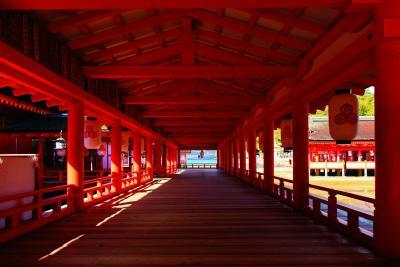 Proximity to the ferry for the Miyajima Island. Very good amenities. Breakfast was expensive and not good. Gym/onsen was not available unless paying an extra 2400 yen per day for each to get access to (this was very surprising to us). The family room with sea view was good and very spacious. 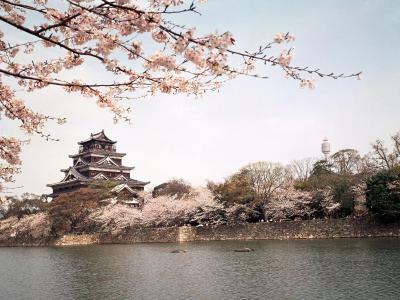 Location is far from the city, restaurants close too early and are overpriced. Expensive prices in the bar. Comfortable room. Obliging, friendly staff. Excellent position.